Yay, I’m so excited that it’s finally February! 1. Because I just needed January to end. And 2. Because I can finally announce my Valentine’s recipe series!! Idk that this is really an official thing, buuuuut I decided that for the month of February, I will be sharing recipes that represent the people I love! Going in no particular order, I decided to start with a recipe for my family. 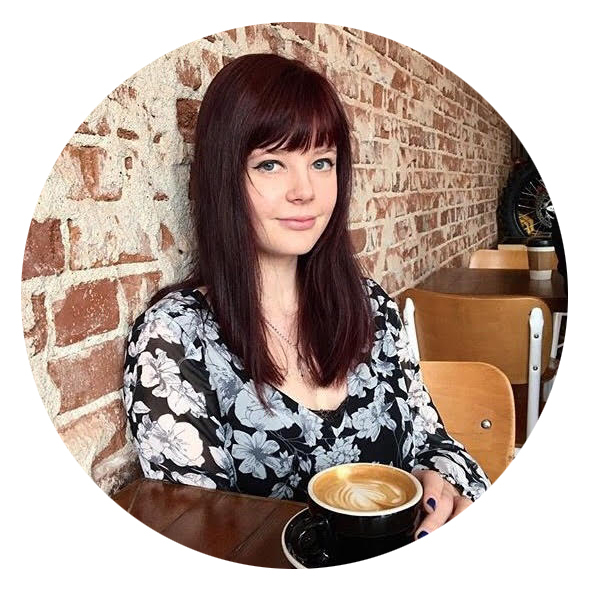 Considering I started this blog to document family recipes, it was v hard to pick just one. 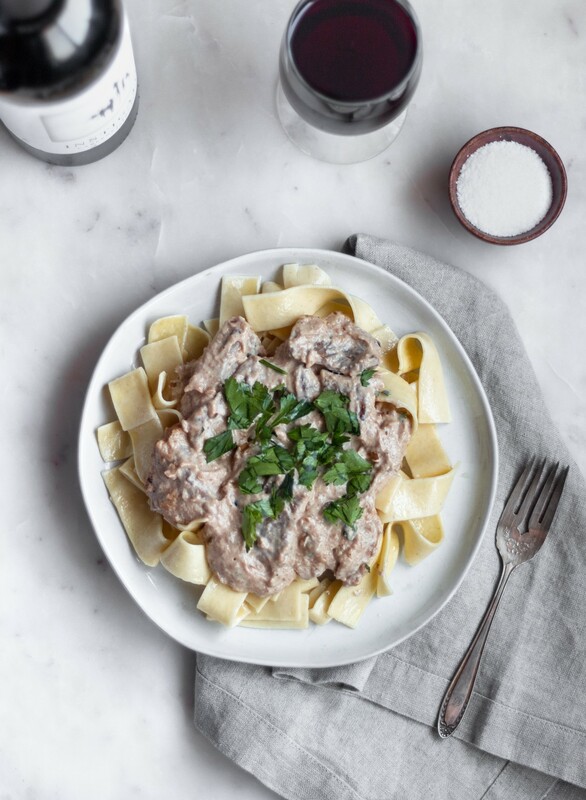 But, this beef stroganoff is probably the dinner I associate with my family the most. It’s definitely not the prettiest food on the planet, but it’s the meal that I have the best memories of. 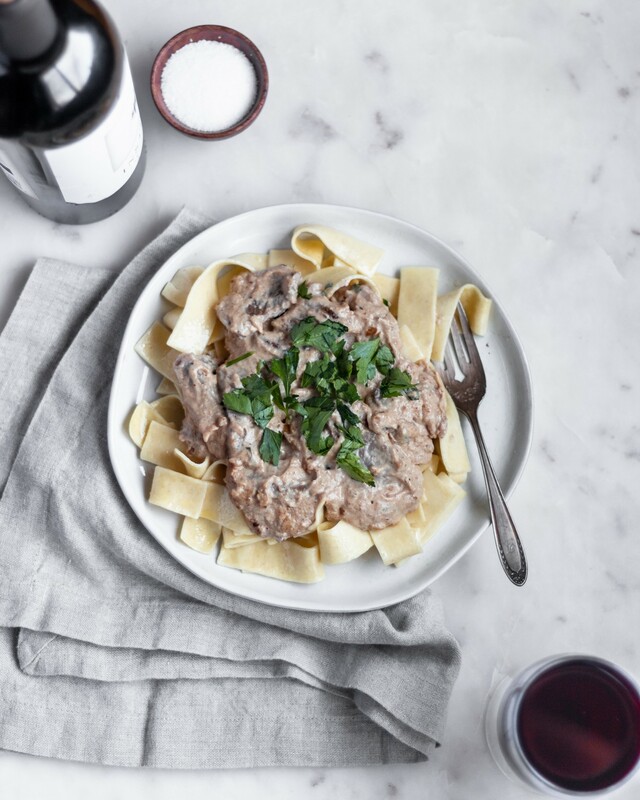 The recipe for this beef stroganoff originally came from my grandma. It’s definitely one of those dinners that doesn’t have a “recipe”, my family just throws it together. 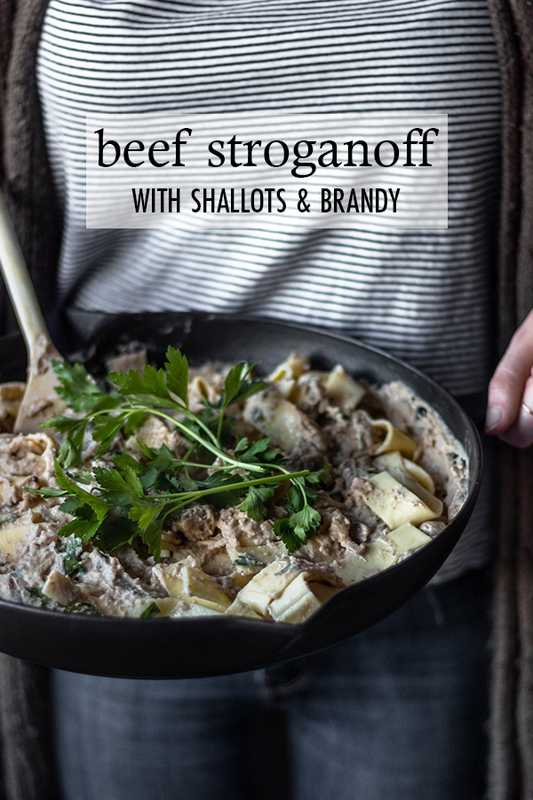 Any time my mom asked me what I wanted for dinner, it was almost always beef stroganoff. With egg noodles and peas, because duh. I would literally load the buttery egg noodles with tons of the gravy and veraciously avoid the mushrooms like they were poison. Me, my mom, my dad, and my brother would all sit around the table in the home where I grew up and eat until we literally wanted to die. To this day, it’s still the recipe that makes me think of my childhood home and all of those dinners around the kitchen table. As I said, this is my grandma’s recipe, but of course, each of us has our own version. I have evolved mine quite a bit, adding more spices and flavors over time. Finally, I have reached the point where I feel like my beef stroganoff is totally perfect. It’s now my go-to recipe when I want something comforting, especially on chilly nights. The only decision you will have to make at this point is whether you are #TeamNoods or #TeamRice. My mom always made egg noodles, while my grandma and aunt always made rice. 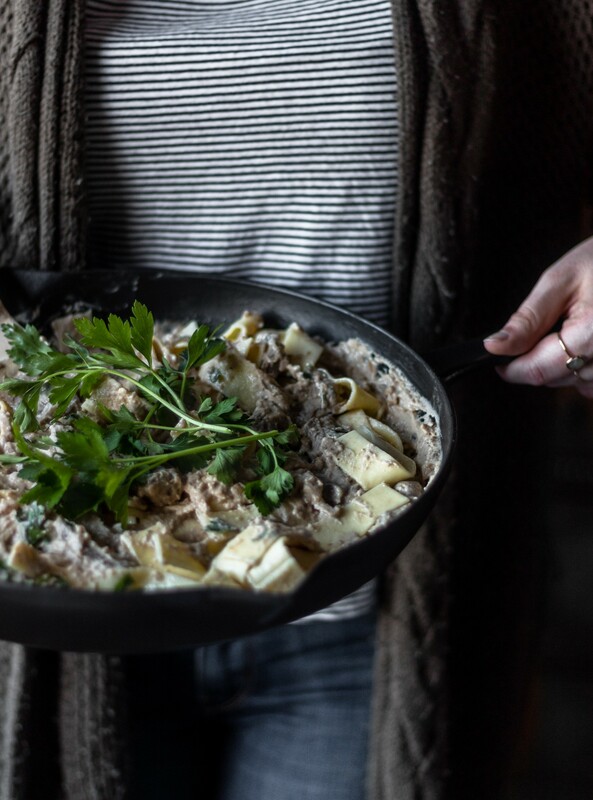 I am die-hard #TeamNoods when it comes to my stroganoff, so you will never see me serving it over rice. But, if you are #TeamRice, live your life. I’ll only judge a little. Oh, and one more note. I still do not *love* mushrooms and pretty much only eat them at other peoples’ houses or restaurants. I genuinely cannot figure out the appeal to that texture. 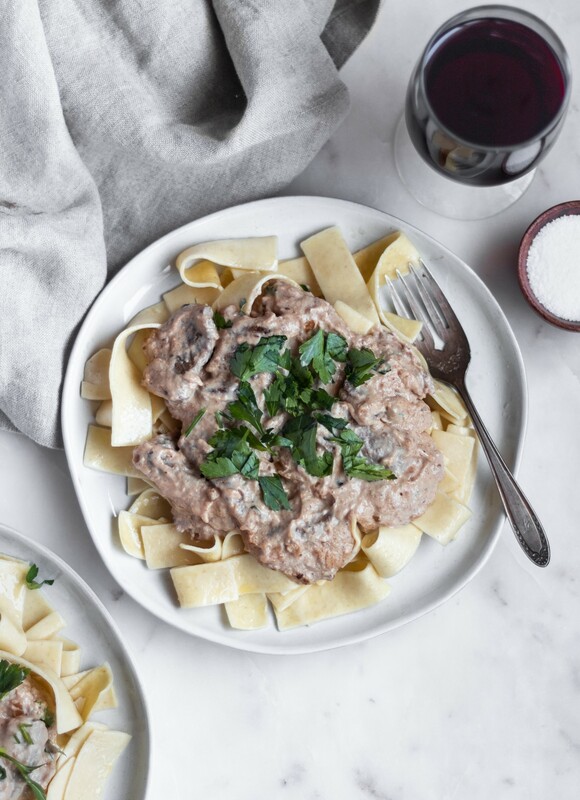 That said, I don’t add mushrooms to my beef stroganoff, but you can totally add them to yours! It’s included it in the recipe below if you feel so inclined. I hope you make this for some loved ones and sit around a table laughing and hugging warm bowls of buttery, gravy-ed noodles. And I hope it makes you feel like you’re in your mom’s kitchen or at your grandma’s house. It certainly does that for me. 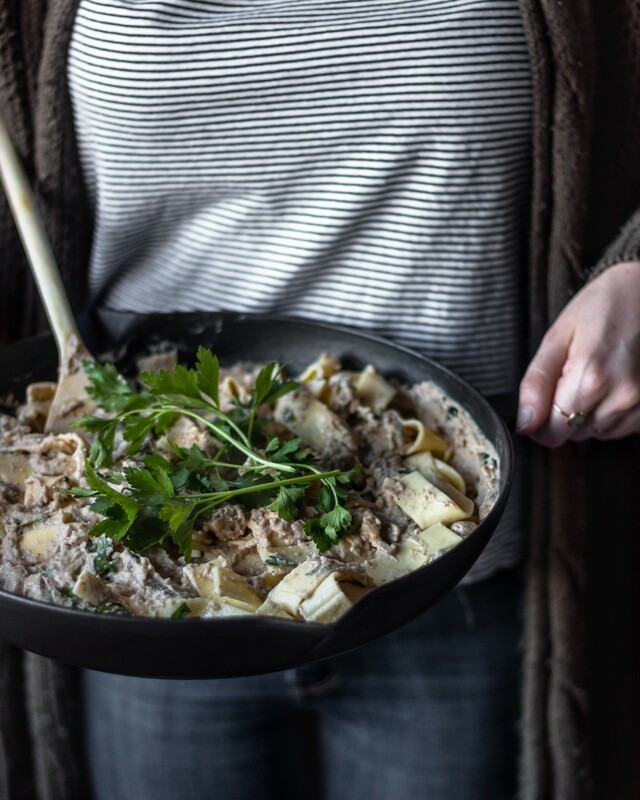 Beef Stroganoff has been my favorite meal for as long as I can remember. Based on my grandma's recipe, I now make an elevated version using shallots and brandy that only takes an hour to cook! Start by drying the meat with paper towels. Place it in a medium bowl. Coat the steak with the flour and lots of salt and pepper. Set aside. In a large pan, heat 1/4 cup of the butter until melted. Add the shallot and mushrooms (if using), and saute until the shallot is translucent. Place the beef in the pan and cook until browned. Add 2 Tablespoons of butter to the pan if it gets dry. Stir in the garlic, and saute until fragrant. Pour the brandy into the pan, and let it reduce until there are only a couple of tablespoons left. Add the beef broth, bay leaf, mustard, thyme, salt, and pepper. Let it simmer for at least 35 minutes and up to 1 hour to tenderize the meat. Meanwhile, cook the egg noodles (or rice) according to package directions. Stir in 2 Tablespoons of butter and couple pinches of salt. When the beef is done simmering, stir in the half of the sour cream. Taste, and add more sour cream, 2 Tablespoons at a time, until it's to your desired consistency. I usually use the whole amount. Cook for about 5 more minutes to heat. Garnish with parsley, and serve over noodles or rice. I’d love some, Sara Lynn!